Each college basketball season we're surprised with a batch of breakout ballers who burst out from the shadows into the limelight. Sometimes these players come in the form of true freshmen, like OU star Trae Young last season. Other times, it can be second- or third-year players, such as former Villanova star Mikal Bridges. Bridges, after development and growth, broke out in unsuspecting fashion as a junior for the title-winning Villanova Wildcats last season. The names of such players are nearly impossible to predict, but the breakout -- oh, the breakout -- you know that's coming. It's just a matter of who. It's what makes the sport such a thrill. So with the help of some analysis taking into account specific situations, role changes and projections ahead towards 2018-19, we've gathered a list of 15 players who could be the next crop of players to fit that mold. But first, some stipulations. (You thought we were going to make this easy, huh?) These players must have been at the NCAA level last season, averaged fewer than 10 points per game, and played less than 22 minutes per contest in 2017-18. Without further ado, we begin with a Wolverines youngster who ended his season on the losing end of the NCAA Championship game. Poole's more than a clutch shot-maker, though his NCAA Tournament heroics against Houston in the second round may be reason why his inclusion is the most obvious of the bunch. He's a known bucket-getter with swag to boot. The Wolverines lose three of their top four scorers from last season's national runner-up squad, so Poole, who played only 12.2 minutes per game last season, should fit seamlessly into Michigan's starting rotation at shooting guard and thrive. His offense will be necessary to UM's success, and offense he shall provide in bunches. 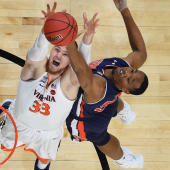 As a freshman last season for the Virginia Cavaliers, Hunter thrived in a role as the No. 4 scorer. His versatility on defense, 3-point shooting ability and raw talent earned him legitimate NBA buzz, too. Alas, a bummer: his season was cut short just before the NCAA Tournament. He's due for not only a bounceback in 2018-19, but a significant leap forward in his sophomore season. The combination of Hunter, Kyle Guy and Ty Jerome is going to make the Cavaliers a real threat to repeat as ACC regular season champs. It's a year late, but I believe I am trending to the point to where I can say "told ya so." I had Broome as a breakout candidate last year -- he averaged 7.9 points per game in just over 20 minutes per game -- but expect those numbers to blossom significantly with Jacob Evans and Gary Clark out the door. McDuffie entered last season as the leading returning scorer and rebounder for Gregg Marshall's stingy Shockers, but a foot injury limited him to what basically amounted to a half-season worth of work in 2017-18. He should be able to pick up where he was expected to pick up last season pre-injury, though, and has a chance to be the team's No. 1 guy -- a role he held in 2016-17. Trevon Bluiett's absence for Xavier leaves a huge void in production that Naji Marshall -- the team's second-leading returning scorer and top-returning 3-point shooter -- could help cover. Marshall won't be putting up 19.3 points per game like Bluiett last season, but he's got an opportunity, alongside Quentin Goodin, to make a big impact statistically on a Xavier team looking to replace its top three scorers from a season ago. Naji Marshall. Buy stock NOW. West Virginia lost its top two scorers from last season. West''s offense will be a requirement to try and keep pace with Kansas in the league next season. Shot-blocker extraordinaire Sagaba Konate will get a ton of pub as one of the top players in the Big 12, but I'm not sleeping on West as a most improved candidate. He and Esa Ahmad are going to make up part of a killer perimeter in Morgantown, West Virginia. Opportunities were few and far between for freshman M.J. Walker a season ago, but when given the chance he delivered. Like his 22-point outing against Colorado State. Or his 24-point outburst against Virginia Tech. He'll have more shots to have more of those nights next season, and for a team that ranks No. 14 in our CBS Sports Top 25 (and one). Mike McGuirl was an enigma last season. Due to injury, he was limited to only eight regular season games. But when he was unleashed into a bigger role, as Kansas State did in the NCAA Tournament, he was fantastic. His 17 points in 22 minutes against Creighton was an example of the regular force he could be next season. For a Bruce Weber-led unit that deep and talented enough to contend for the Big 12 title, McGuirl figures to be an X factor at worst, and a reliable everyday starter at best. Jahvon Quinerly, Eric Paschall and Phil Booth are going to get plenty of pub, but rising sophomore Collin Gillespie should be getting mention as an impact player for the reigning NCAA champs, too. He shot 39.4 percent from the 3-point line as a freshman in limited run, and has a chance to break into the starting rotation in his second season. Skaggs played in all 31 games last season for the Cougars, and despite playing just 20.5 minutes per game, he finished ninth in the Pac-12 with 2.2 3-pointers made per contest on an efficient 40.4 percent clip from long range. In an increased role, it's reasonable to expect his 8.2 points per game last season eases into double digit territory for Wazzu. Jones isn't your prototypical breakout-player-in-waiting. In 21.2 minutes per game worth of action as a freshman last season, he scored only 4.2 points and added 3.5 rebounds per contest. It's not his offense that will earn him accolades, however; Jones figures to be the Tide's primary defensive stopper in his second season. He's long, agile and a bona fide thief defending on the perimeter. Whether his offensive production increases or not -- and with Collin Sexton and Braxton Key gone, it should -- Jones is in line to be a central figure for Avery Johnson's team. Lykes is the shortest of this crop of players at 5-foot-7, but what he lacks in size he makes up for in entertainment value. He's the type of player you'd get if you mixed Isaiah Thomas with Nate Robinson. Short, shifty, and heady. After Bruce Brown went down for Miami last season, Lykes stepped up, averaging 12.8 points per game in his absence. He should be in for a similar stat line next season with Lonnie Walker and the aforementioned Brown now off to the NBA. Like Lykes, Texas A&M's TJ Starks has his own next-level explosiveness that jumps out at you. He was a primary ball-handler for the Aggies last season where he averaged just shy of 10 points per game and dished out 2.3 assists. In his second season in Aggieville, Starks figures to again shoulder primary responsibility as a ball-handler. He should also see an increased role on offense, as Tyler Davis and Robert Williams are both off to the pros. Illinois fielded a sorry basketball team last season, but the lumps it took could pay some dividends this season. If you're looking for a breakout star in the Big Ten, there's few more obvious answers than the Illini's Kipper Nichols. In addition to having, without debate, one of the top-5 names in the conference, Nichols has top-5 versatility, too. He's a fantastic defender, versatile, and mobile. Add in his 3-point shot, which dipped in efficiency last season but should tick back up, and it's easy to expect he gets some shine on an improved Illinois team. Marcus Foster? Gone. Khyri Thomas? Gone. Toby Hegner? Gone. There's opportunity galore for any number of Bluejays players to break out this season, but I'm looking at Mitch Ballock, a rising sophomore, as the one who is slated to make the biggest leap. As a freshman last season, Ballock served as a reliable shot-maker and solid rebounder. Those qualities should earn him more run as a sophomore, and if he can improve as a playmaker the chance for a starturn may be imminent for him in Omaha.